“It’s Time for a Break”, with Break Time Vending Services! We provide you with all the wonderful benefits of having modern vending machines in your office, work areas, lunch room, and customer areas. Whether you run an industrial complex, an educational facility or a small office, we have custom solutions that will cater to the needs of your employees, customers, faculty students, or visitors. Our large variety of name brand candy, crackers, natural snacks, chips, pastries, gums and mints round out run the full range of delicious treats and quick meals. 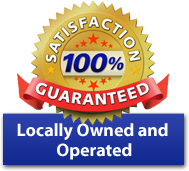 We also feature cold food, coffee service and water service programs. Your employees work better and are more productive when they aren't hungry! Water service provides fresh, clean, sparkling water to chase away your thirst. Today, people everywhere are looking for healthier snacks. We hear the call! Break Time Vending Services responds with a delightful variety of healthy, energy giving snacks that include peanuts, granola bars, baked chips, trail mix, cold food sandwiches and instant cup-a-soups. Break Time Vending Services provides only clean reliable machines installed and maintained in your location at no extra charge. We keep the latest technology running smoothly with scheduled service and rapid response to any problems or repair needs. 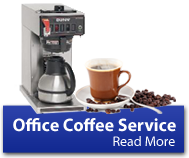 Please feel free to contact us to discuss a customized solution for your snack, beverage, office coffee service and water service needs. 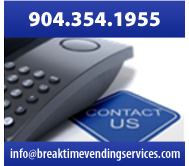 Call 904.354.1955 or Email info@breaktimevendingservices.com.